This topic refers to functionality that is only available to accounts on the Quick Base Platform or Quick Base Unlimited plans. If you do not see the functionality described here, either your account or realm has not been configured to show it, or your account is not on one of those plans. If you've decided to create a sandbox application, it's because you want to develop and test some major changes and updates to your live application. During this kind of application development, it's important that you restrict all development changes to the sandbox. Therefore, when you create a sandbox, Quick Base locks the live application. At that point, no users can make any changes to the application. Note: The app manager (and only the app manager) has the ability to unlock the live application. This action is restricted to only the app manager (and not allowed for other app admins) because it could result in unexpected changes or in blocking an update entirely. As a best practice, app managers should avoid unlocking live applications manually. Only unlock the live application when you've decided to discard the sandbox application without applying changes. Quick Base, of course, expects you to make some changes to the sandbox application; therefore, a locked sandbox doesn't mean you can't make any changes. 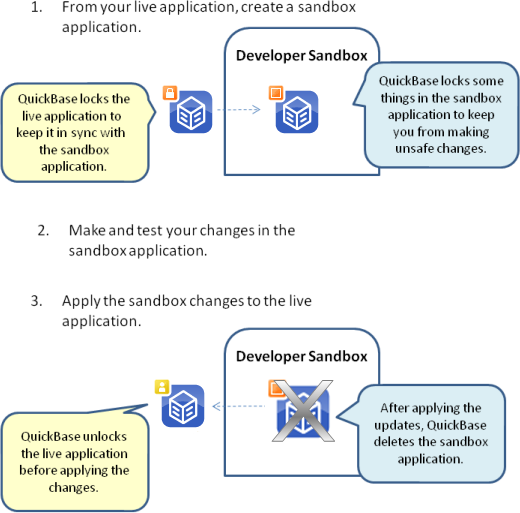 Locks in the sandbox application prevent you from making any changes that could cause issues when applied to your live application. For instance, Quick Base won't let you delete fields, tables, or relationships in the sandbox application. Quick Base enforces these locks through both the UI and the API. Quick Base gives you some visual cues as to what's locked and what's not in the sandbox application. For instance, you'll see lock icons in the sandbox application. Lock icons identify those objects that existed in the live application when the sandbox application was created. Quick Base doesn't let you delete these objects in the sandbox application. (You can change their properties, though, if you'd like). Quick Base does not allow you to apply updates from the sandbox before you perform a compatibility check between the live application and the sandbox application. During the compatibility check, Quick Base compares the sandbox application to the live application and checks to make sure you are not trying to apply any destructive changes to the live application. If Quick Base finds issues, you will not be able to proceed with the update. Instead, Quick Base points out exactly what caused the problem, and provides tips as to how you might fix the problem and proceed with the update. Can I create more than one sandbox application from the same live application? Yes, you can indeed create several sandbox applications from the same live application. You might, for instance, want to test two or three different approaches using sandbox applications created from the same live application. Once you've applied changes from either sandbox application, Quick Base unlocks the live application. Quick Base also deletes the sandbox application you used to apply your changes. At this point, you've got another "active" sandbox application. But remember, your live application is no longer locked. That means that the sandbox application is not necessarily an accurate "snapshot" of your live application and shouldn't really be used to apply changes. Therefore, if you have created multiple sandbox applications from the same live application, you should follow the best practice of deleting all sandbox applications that remain after you apply changes from one sandbox application. What happens when I apply sandbox updates? Applies the sandbox updates to the live application. Changes to your app's schema are applied to the live application, but any records created in the sandbox will be lost. This article doesn't point out that when the sandbox app is applied to the main app, any records created within it will be lost. It's only the schema changes that are applied currently. What happens when I cancel a sandbox update? If you cancel the update instead of clicking Apply Changes, the live application lock stays in place. Only the app manager can unlock the live app when sandbox updates have not been applied. See About live application locks, above.